Enter the Genius Lab, Exit with 21st Century Literacy. 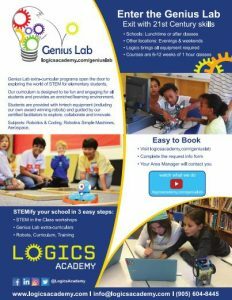 The Genius Lab from Logics Academy opens the door to exploring the world of STEM for students grades 1 to 8. Our progressive curriculum is designed to be fun and engaging for all children, regardless of experience or ability, and to provide an enriched learning environment. Students are provided with hi-tech equipment, including our own award winning robots, and guided by our certified instructors to explore, collaborate and innovate with their peers. A wide variety of STEM subjects are taught through Robotics & Coding, Robotic Simple Machines and Aerospace enabling the children to create and problem solve using a variety of scientific techniques. The Genius Lab can be offered weekly at schools (before, lunchtime or after) and at other locations in the evening or on weekends. Logics Academy provides everything required. Bring our programs to your child’s school by sharing the attached flyer with your school administrator. Register your child for one of our programs? CLICK HERE to view program locations and information. Host a Genius Lab program at your school, corporate or community site by completing the information below. A representative will connect with you to bring our programs to your location.